"WASHINGTON, D.C. – The Hispanic Association of Colleges and Universities (HACU) praised a vote by Congress to continue funding for two community technology programs that will help bridge the digital divide between minority and non-minority populations. Congress voted to continue federal funding for the Technology Opportunity Program (TOP) and the Community Technology Centers (CTC) program as part of the federal fiscal year (FY) 2003 budget. Each program had been facing the threat of elimination. “We applaud the foresight and leadership of Congress in continuing these programs that are so effectively addressing the technology needs of Hispanics and other under-represented population groups in this high-technology economy,” HACU President and CEO Antonio R. Flores said. “This is also a tribute to the success of the many, diverse organizations that came together as the Digital Empowerment Campaign to keep these fundamentally important programs in place. As a coalition, we will continue to advocate for the continuation of these programs as part of the FY 2004 budget now being debated by Congress,” Flores said. HACU is part of the massive Digital Empowerment coalition that also included the Leadership Conference on Civil Rights, CTCNet, Policy Link, the Children’s Partnership, the Consumers Union, the Benton Foundation, and more than 100 other national and community-based organizations. 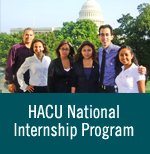 HACU served as a member of the special committee of the Leadership Council on Civil Rights, which worked towards the enactment of this program by Congress. The Technology Opportunity Program (TOP) was created in 1994 to provide grants to low-income and other under-represented communities lacking adequate technology access. Since its inception, the program has awarded more than 500 grants in all 50 states. The Community Technology Centers (CTC) program since its inception in 1999 has awarded more than 225 grants to provide computers and technology education to low-income communities. A 2002 report by the Leadership Conference on Civil Rights Education Fund and the Benton Foundation, with support from the Ford Foundation, showed that continued federal leadership is critical to bringing more Americans “online” in the Information Age. The report, “Bringing a Nation Online: The Importance of Federal Leadership,” reinforces findings that a digital divide based on income, race, ethnicity and geography is hindering efforts to provide every American access to adequate technology access and training. For example, the report showed that Internet use among Hispanics is less than half that of non-Hispanic whites. The report included profiles of 44 TOP and CTC programs in 25 states that proved successful in leveraging matching resources and as catalysts for new partnerships that are comprehensively addressing the digital divide in program communities. For more information, contact HACU at (210) 692-3805. Ext. 3214. Or visit visit www.hacu.net. For more information about the work and membership of the Digital Empowerment Campaign, visit www. digitalempowerment.com. "